The United States Congress designated the Sky Lakes Wilderness (map) in 1984 and it now has a total of 113,687 acres. All of this wilderness is located in Oregon and is managed by the Forest Service. With a name like Sky Lakes, this Wilderness is obliged to deliver at least more than one impressive sapphire pool, and it does. In fact, it takes in three major lake (former glacial) basins as it stretches along the crest of the volcanic Cascade Mountains from the border of Crater Lake National Park on the north to State Highway 140 in the south: Seven Lakes, Sky Lakes, and Blue Canyon basins. All of southern Oregon seems to lay at your feet when viewed from the rugged summit of the beautiful volcano Mount McLoughlin (elev. = 9,495 feet a.s.l. 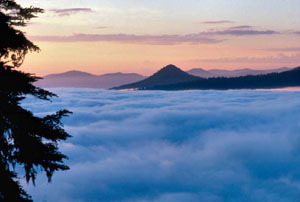 ), and then extends out northward into Sky Lakes' broad plateau-like ridges, dotted with many of the Wilderness's lakes. You'll find creeks and ice-cold springs (such as Ranger Springs, where the Middle Fork of the Rogue River springs to the surface almost "full-grown" from the beneath the lava), grassy meadows, and scores of crystalline sub-alpine lakes. Several of the Wilderness's lakes (Alta and Natasha among them) were found (by 1980s-90s E.P.A. baseline study of acid-rain conditions in Western U.S mountain lakes) to have among the most chemically pure water known of all lakes on the globe. Most of the area's lakes (some of them stocked by the State of Oregon with game fish) are set against a backdrop of tall trees that reach to the edge of the lakeshore. An overall high-elevation forest consisting largely of Shasta red fir, western white pine, and mountain hemlock yields to lodgepole pine around many of the lakes, as well to moisture-loving Engelmann spruce here and there. Hardy, long-lived whitebark pines are found near the summits of Mt. McLoughlin and Devil's Peak. The forest's understory is dominated by species of huckleberry, as well as manzanita, snowbrush, and heather. Elk herds spend much of the summer and early fall in the northern third of the Sky Lakes Wilderness, and the elk-hunting season can be very active; the entire wilderness supports roving populations pine martens and fishers, black bears, cougars, coyotes, as well as pikas and golden-mantled ground squirrels and other species of wildlife. During October and November, migrating birds pass over in the hundreds of thousands, often stopping at the high lakes. Ospreys regularly visit Sky Lakes to try their luck at fishing. Thirsty swarms of mosquitoes hatch from snowmelt until mid-August. The Pacific Crest National Scenic Trail passes the entire length of Sky Lakes Wilderness north-south for about 35 miles, but much of the PCNST's route is well away from streams, springs, and other water sources. Human use is heavy in the three main lake basins, particularly at the larger lakes, which are popular fishing, hiking, and camping destinations. The 1888-inscribed "Waldo Tree," at the southeast shore of Island Lake is a draw for a few historically minded visitors each year, as is the opportunity to hike along the route of an 1860s-1890s military wagon road, on the present Twin Ponds Trail. The summit of Mt. McLoughlin is a popular but very strenuous summer day-hike. Other areas of the Wilderness typically provide excellent opportunities for solitude. Planning to Visit the Sky Lakes Wilderness? How to follow the seven standard Leave No Trace principles differs in different parts of the country (desert vs. Rocky Mountains). Click on any of the principles listed below to learn more about how they apply in the Sky Lakes Wilderness.